A shared use footpath, a segregated cycle path, and shared surface roundabout all in one. 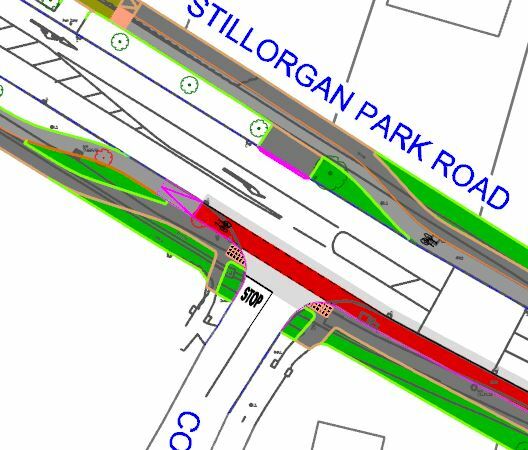 Dún Laoghaire-Rathdown County Council have published a report from their consultants about a planned upgrade of the Stillorgan Park Road. Elsewhere the council are planning a highly promising looking cycle segregated route on Braemor Road and they are making small but very effective interventions such as barrier removal. 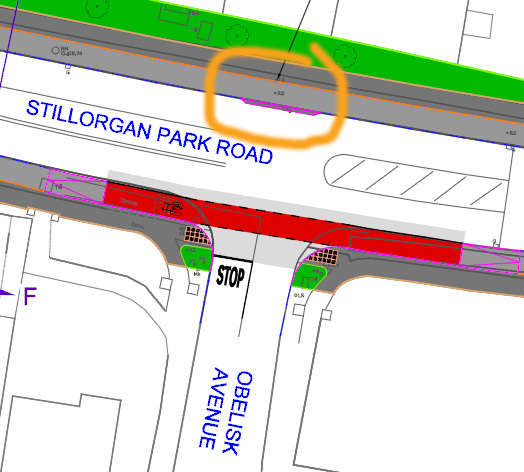 But the Stillorgan Park Road project is still the kind of thing that gives segregation of cyclists a bad name. A quick look at the drawings for the scheme shows that the cycle route clearly will not be fully segregated from pedestrians (or motorists). Another major problem with this quote is that cyclists are a type of vehicular traffic — you can’t segregate cyclists from vehicular traffic when bicycles are vehicles under Irish law. The above statement from the report is unable to be factually correct. It’s misinformation — intended or not. 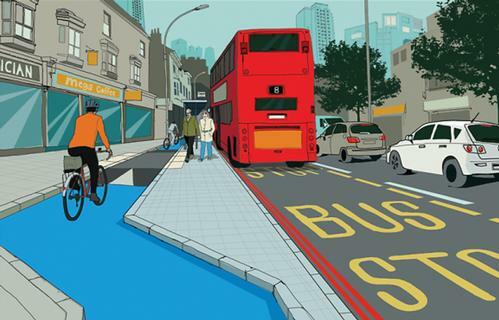 The cycle path and footpath merges into shared use at the bus stop: This isn’t “full segregation” – it’s putting cyclists and bus users in direct conflict. That’s traffic volumes 170% higher than what the manual allows for for this design. 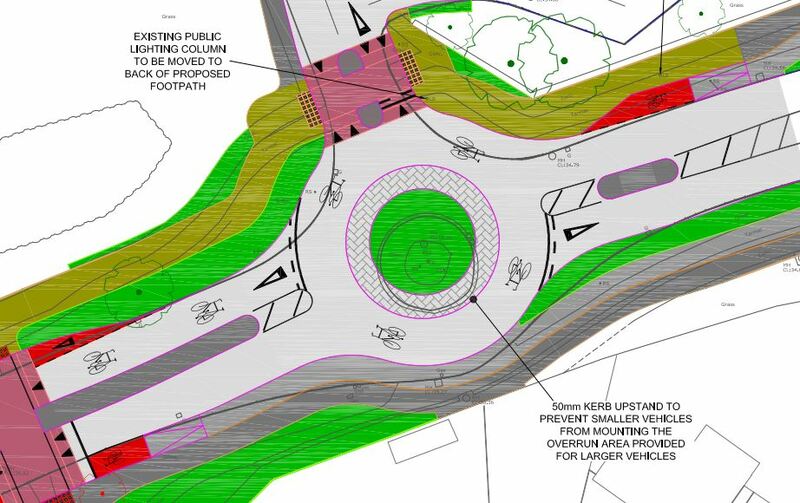 The highly compromised design fix is to use the “shared roundabout” and to tack on a shared use footpath on one side, an off-carriageway cycle track on the other, and a shared use crossing. The message here to cyclists can’t be clearer: Use the road or footpath when you like. And Fintan O’Tooles of this world are still — somehow — left to wonder why some cyclists think it’s ok to use footpaths! 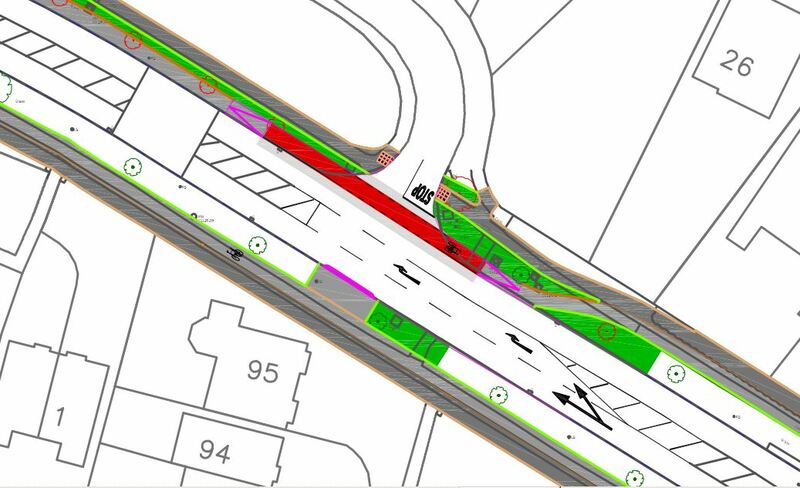 Shared use is also used where the council want to give cyclists traveling westbound access to a right turn (where cyclists would otherwise have to cross three and a half lanes near a busy junction with the N11). It’s harder to fault this given the reasoning for it but it’s hardly best practice and could be done without shared use without trying too hard. When you overuse shared use it’s too easy to fall back on it as a solution to every problem, regardless of a large percentage of pedestrians and cyclists disliking or hating it. 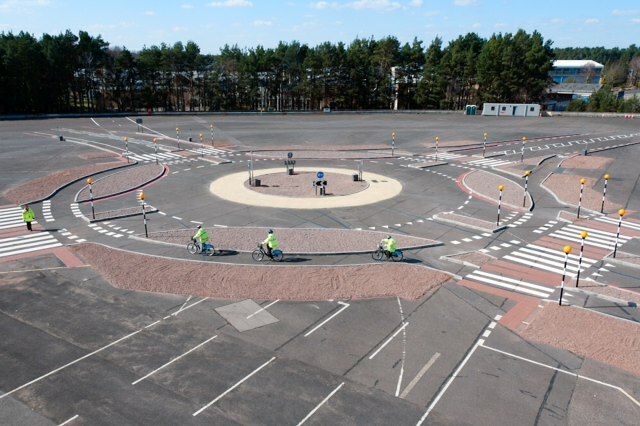 How effective this design will work at junctions not controlled by traffic lights and with a turning lane in the centre is up for debate, but having the ramp locations misaligned just brings back memories of cycling infrastructure we should be beyond. The radius of the corners shown above and else where on the drawings are not stated, but judging from the drawings these could be incompatible with guidance given in the Design Manual for Urban Roads and Streets — it’s unclear. Thanks for articulating a complicated situation. I used to use this route coming and going to UCD. Any improvement could only be welcomed. All those twist, turns, ups and down would leave you sea sick on the way up towards Stillorgan. Is there a plan to remove that lethal trap at the Coppinger Wood junction? I nearly got flattened by a car pulling out of here a couple of years ago. I still get a bit quezy when I think how close to getting creased because of really poor planning. Unfortunately I am not sure this is actually going to be much of an improvement. DLCoCo must have a Celtic Tiger type budget burning a hole in their pockets as they go “half assed” addressing cycling issues in the Borough. Has anyone tried cycling from the junction of York Road and Cumberland street to the centre of Glasthule recently? It is now an extreme Cycling experience as it combines the navigation ability of Jeremiah Johnson with the cross country ability of a mountain goat. @John: The Coppinger Wood junction seems improved. The cycle track is now beyond the stop line for traffic coming out of the estate and the track is marked in red. I really hope the new layout forces the cars stop at the Stop sign at Coppinger Wood junction, because at the moment they do not. Meaning because of them and the barriers you have to stop at every junction. I live beside this busy road I cycle, drive and walk it frequently. 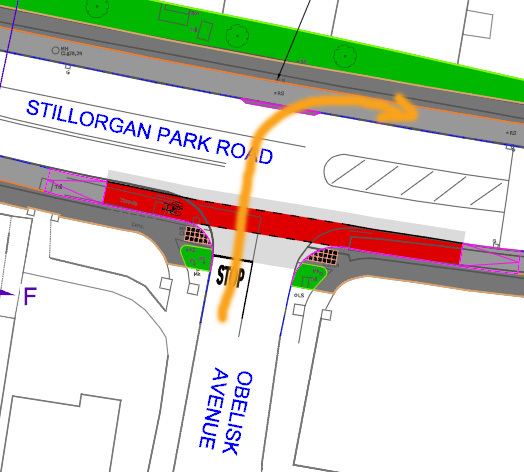 This so called improvement is to make provision for a new bus route on Stillorgan Park road and nothing more. Having cycled around the roundabout I know its dangerous, cyclists under the current plan will leave the cycle path and enter the road west of the roundabout and then have to cycle onto it. Totally unacceptable. 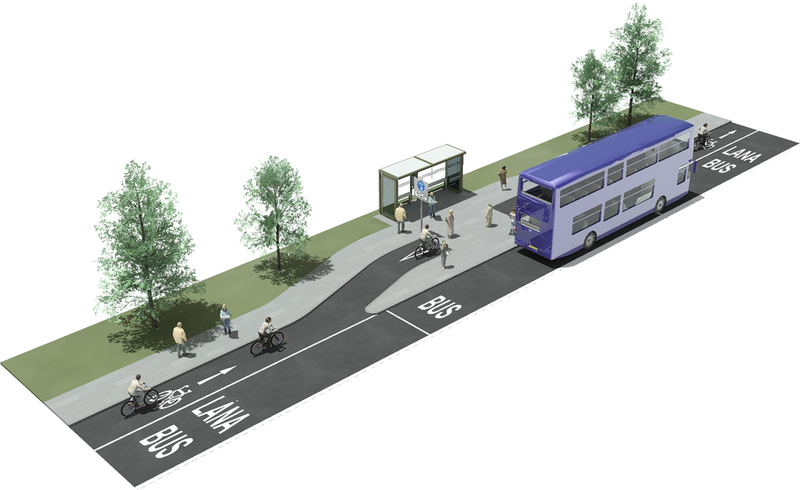 I would prefer the existing straight run of cycle path and footpath to remain and the bus stop to be deleted. A lot of trees will be felled and this isn’t necessary. Improve the junctions and the cycle path markings and leave it much better than that proposed. Look at what happens on the N11 going north as you enter the road just before Foster’s Avenue, its an accident waiting to happen!